Many moons ago, I worked for a software company called ITP, which was the child of a company with the same name located in Italy. In Italy, the name was short for “Informatica e Tecnologia per la Produzione”. In English, ITP didn’t stand for anything, though we joked that it stood for “Italian Technical People”. One year, a few guys from the Italian office came stateside to work with the team. The company was populated by young technical professionals (computer geeks), and we were very social. We shared meals together, went out for drinks together, and played highly competitive games together (Killer versions of Uno and Pictionary). We integrated the Italians into our fold. Lucio and Guido were excellent cooks and enjoyed sharing “real” Italian food with us. It was from them that I learned about spaghetti carbonara. What’s not to like about bacon and eggs and cheese. It was also easy to whip up for a crowd. Saute the bacon while the pasta cooks, then toss with scrambled eggs that get cooked by the residual heat of the pasta. Add a healthy dose of Parmesan cheese and, voila (or the Italian equivalent): you have a meal. In this incarnation of carbonara, no pasta is involved. Steamed strands of onion stand in for the pasta, though the sauce is classic. 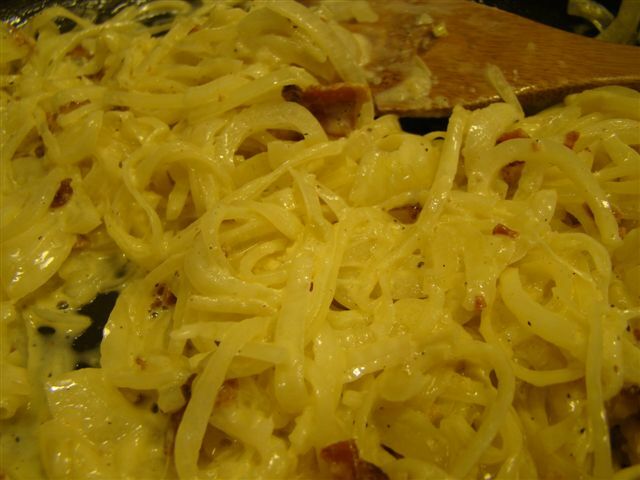 Onion carbonara is simple to make. As I said, you steam the sliced onions. And you fry some bacon. After that, the sauce takes just minutes to complete. Melted butter is mixed with the bacon and cream. The onions (aka faux pasta) are warmed in this sauce. Add more cream and an egg yolk and toss to cook the egg. Finally, add some Parmesan cheese and it’s ready to serve. The final result was definitely interesting and completely edible. However, I prefer the classic pasta version (or my memory of it) and plan to add it back into my kitchen lineup in the new year. To try the low-carb, no pasta, onion version, you can find the recipe here. Or, you can always find it in Dorie Greenspan’s book Around My French Table. To see how the Doristas did with this one, follow their links here.